The Minimoog synth found a place in just about all genres of rock, pop and dance music, including various flavours of funk. Its frequency-rich sound and serpentine portamento made it an integral component in the works of, most notably, Parliament and its offshoots. 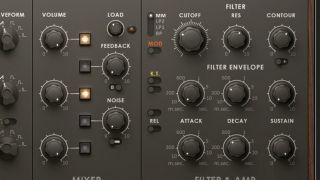 Here, we'll show you how to put together a Bernie Worrell-style bass tone using Native Instruments' phenomenally realistic Minimoog emulation, Monark. Find out more about emulating Moog synths in software in the October edition of Computer Music (CM234). Step 1: Thanks to its beefy bottom end and with the help of innovative performers like Bernie Worrell, the Minimoog became a staple of funk music. Let's give it a try for ourselves using NI's Monark. Here, we've got it loaded into Reaktor 6. We'll call up the Init patch from the User Bank as a starting point using the dropdown patch menu. Step 2: Even this initialised sound has a special Moogish character. Let's start by setting Oscillator 1's Waveform switch to the sawtooth wave for more harmonic content. Now, let's go to the Mixer section and click the button that brings Oscillator 2 into the mix. We can leave Oscillator 2's settings as they are, as they make a good pairing with Oscillator 1 as is. Step 3: Let's add some more meat by setting the Mixer section's Load button to around 11 o'clock. Now, moving to the Filter, dial the Cutoff back to 10 o'clock and push the Res up to 1 o'clock. The sound will now be dull. We want the Filter Envelope to create some movement, so set the Contour to 1 o'clock - that's the 'filter envelope amount' in Moog-speak. Step 4: We need to adjust those envelopes. Set the Decay of both to 600, with Attack times at nearly nil. The Filter Envelope's Sustain should be set to min, while the Amp Envelope's Sustain should be set to max. Now try increasing the Glide Time ever so slightly. Have a play with the patch. That's fantastic! Go ahead and do some tweaks of your own to personalise the sound to your taste.